I was glad to learn I'm not the only one watching my Ps and Qs. It appears that The Emily Post Institute receives thousands of queries about manners and etiquette every month. Who'd have thought! Peggy Post's great-grandmother-in-law, Emily Post, became well known as the one to turn to in times when manners were important. Very sadly nowadays, it seems that manners are not being taught as much and children, especially, don't know how to behave. I have to say, to a large extent, neither do many adults. 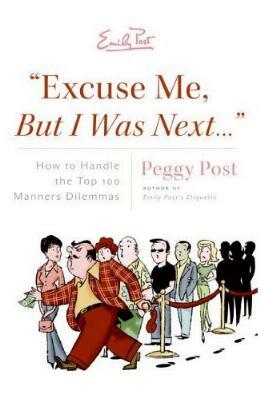 Ms. Post's book is made up of questions to The Emily Post Institute from the public, on a wide variety of subjects, from office behavior, tipping, gifts, greeting people, cell phone use (a huge pet peeve of mine), dating people, table manners, guests, weddings, and more. I think everyone should have "The Good Guest's Bible (pages 178/179) drummed into them. How much more pleasant entertaining would be! One thing that gets my goat, is when mothers stipulate what to buy as birthday gifts for their young children - see my blog about this. How rude! I love that Ms. Post hammers home the idea of thank-you notes. I believe manners should be taught at home, but with fewer and fewer parents actually giving a darn (why do they have kids?! ), consequently there are more and more rude people about. (This is grist for my own book I'm writing.) Thankfully though, it seems that many people don't want to make social faux pas and actually seek out the correct etiquette. Yay, there's hope after all. Visit The Emily Post Institute website for more information. Conclusion - Easy to read and full of advice for everyday stituations.